Oh, what fun to have a patent leather accented bridle! The Victoria Flash Bridle, crafted from gorgeous supple Italian leather, will be noticed around the barn or in the show ring! The brown on brown is a standout though the red on brown is extremely distinctive. Fine Stitching and 5/8 inch cheeks compliment the beauty of this bridle. The Victoria is finished stylishly with extremely soft padding and a throat latch that adjusts on both sides. 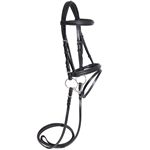 Hook studded soft grip reins complete this bridle. Sure to be a Nunn Finer favorite!